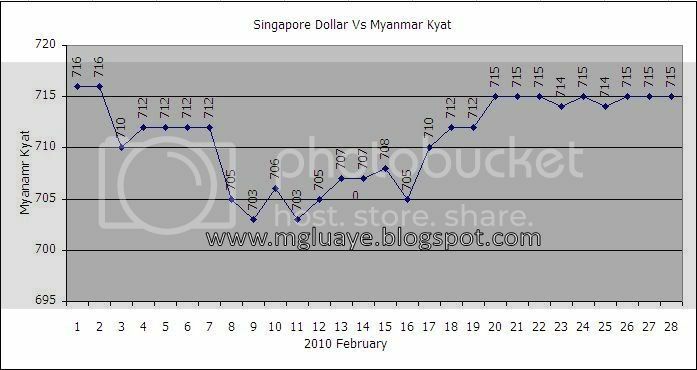 For the month of February 2010, the average exchange rate between SGD and Myanmar Kyat was 710.9285714 Ks/SGD, reach highest up to 716 Ks/SGD on 1st and 2nd of February and fell lowest until 703 Ks/ SGD on 9th and 11th of February. 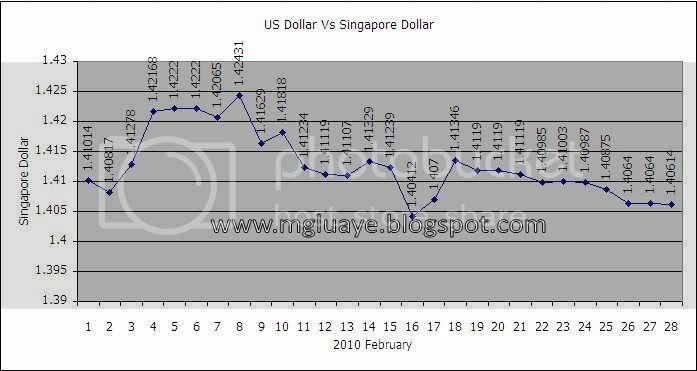 For USD vs SGD, the average rate for the month of February was 1.412638929 SGD/USD, highest 1.42431 on 8th of February and lowest 1.40412 on 16th of February. The rate of SGD Vs Myanmar Kyat was taken from daily record on MGLUAYE'S PAGE sidebar and rate of USD Vs SGD was taken from http://www.exchange-rates.org . The exchange rate shown on the chart are for informational purpose only. The data shown on these charts especially on SGD Vs Myanmar Kyat are taken from various sources so that we will not take any responsibilities for referring these data to use as official purposes. really thought youd have something attention-grabbing to say. can fix when you werent too busy looking for attention. I do agree with all the ideas you have presented in your post. starters. Could you please extend them a bit from next time? Thanks for the post.